Today was a snow day, one of the first real snow days of the year. By coincidence my fiancé woke up with a stomach bug, so it was a good reason to stay indoors all day. 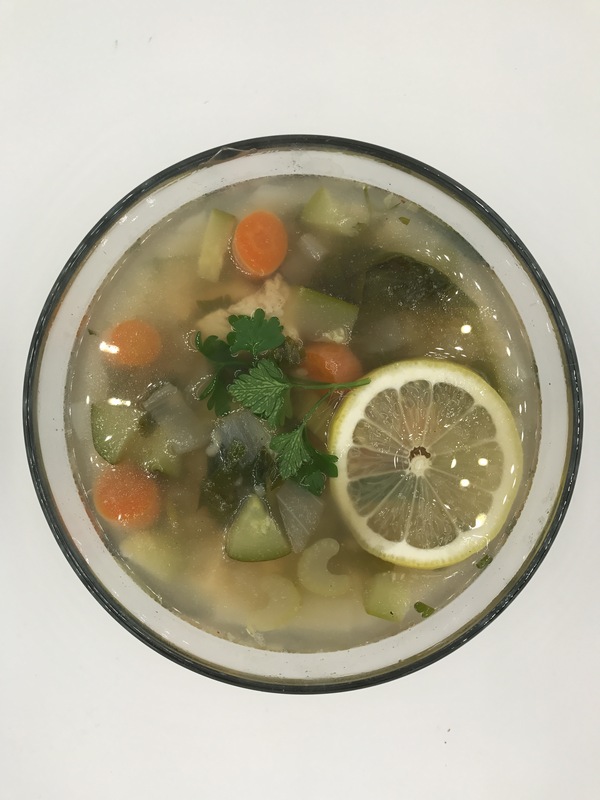 This Lemon Chicken and Couscous Soup was the perfect thing to keep us toasty warm and to help him feel better. A real cure all! Usually on a snow day we’d try and venture outside and sit in a cozy bar, however Matt woke up with a nasty stomach bug. So my snow day turned into a lazy day inside with lots of food network and football, which is equally enjoyable. I decided to have something ready waiting for Matt to eat when he woke up so that he could refuel after puking all night. I wanted something warming and hearty, but it also needed to be healthy and light so that Matt could keep it down. As it so happens, I was watching Food Network in the morning and saw Trisha Yearwood’s Lemon Chicken Soup with orzo and it looked like exactly what Matt needed. No offense to Trisha but the recipe also looked pretty bland, although she adds lemon there were hardly any seasonings! I also knew I needed to make some substitutions for what I had on hand, so I decided to recreate it with my own twist. This soup turned out to be delicious. 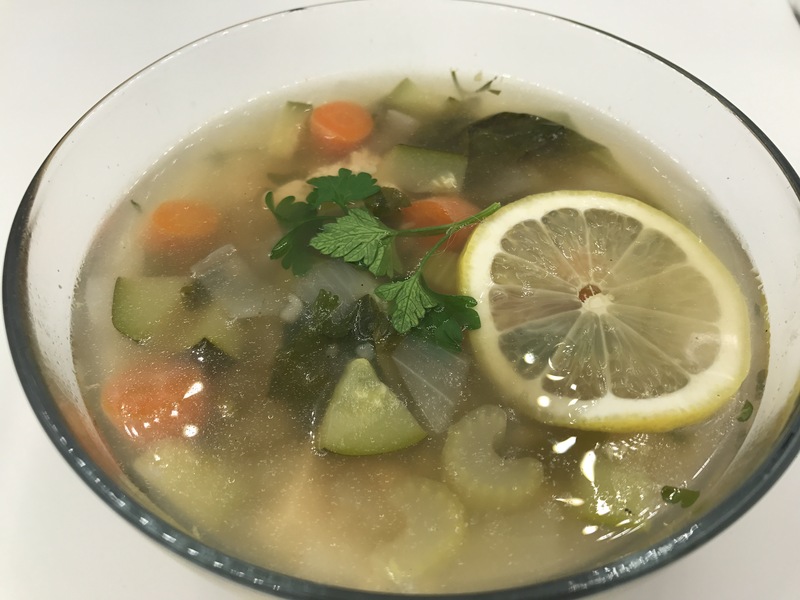 The lemon adds a nice light and refreshing flavor to the broth, but earthy thyme and hearty couscous made it filling and savory. It was brothy enough to soothe a stomach but you didn’t feel like you were missing anything. I can definitely see this becoming the new “go-to” for whenever one of us it sick. Not to mention it was EASY! I didn’t even sauté the veggies first! And to top it off, a serving is only about 150 calories. Bring a pot of stock, water, onion, carrots, and celery to a boil. Once it’s boiling add in salt, pepper, thyme, the bay leaf, and the Couscous. Let the Couscous simmer for a few minutes until the pearls start getting soft. Salt and pepper the chicken cubes and toss them in the soup along with the zucchini. Let simmer for about 6 minutes until the chicken is cooked through. Add in the parsley and spinach and cook until wilted. Finally, add the lemon zest and lemon juice and stir to combine. Taste for seasoning, and add in a dash of red pepper flakes if desired. Serve and enjoy!